Zunka is a Maharashtra Dish prepared with Besan Flour (Chickpea flour) and a similar version is available in Karnataka also. It is generally prepared using veggies such as Capsicum, Methi or Cabbage. It is a kind of Easy to make Dry Subzi. As broccoli also comes under Crucifers family (Cabbage's family), I had hoped this dish would turn out well and came out neat, really worth the trial. Got a New tasty side dish recipe in my Broccoli recipe Trials. Easy to prepare healthy side dish for rotis and parathas. Extra healthy with the addition of broccoli. 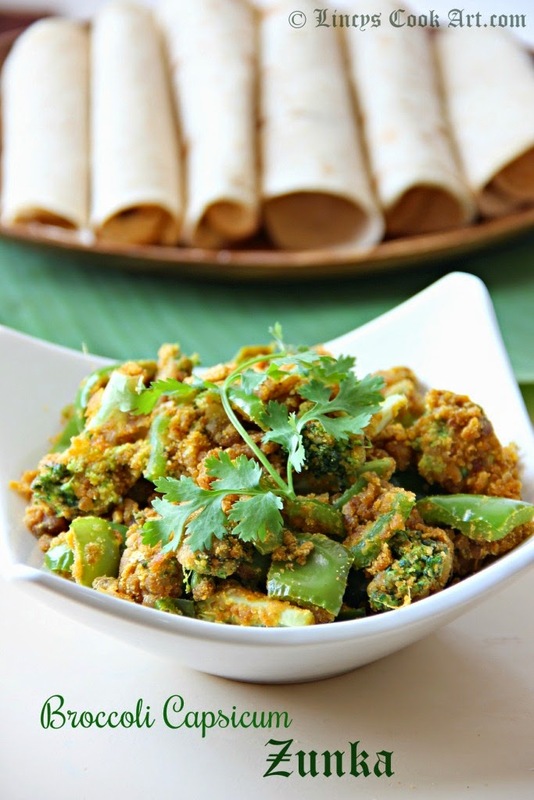 The crunchy capsicum and the broccoli in the roasted besan masala are really easy to make and are a delight. Try this dish for dinner and make your family members happy and also healthy. A must try super easy healthy dish. Dry roast the chickpea flour till the slight aroma arises on low flame; Set aside. Do not burn the flour. Heat oil in a pan and add the Onion and salt cook till it becomes soft. Add the green chillies and ginger garlic paste and cook till the raw smell leaves. Now add the broccoli and capsicum with salt; roast in the same oil on medium high flame. Water should not ooze out as we have got to roast the veggies in the same oil. Capsicum starts to get light white blisters on the skin. Now add the turmeric, chilli powder, coriander powder and garam masala powders. Mix the masalas with the veggies and cook for a minute. Add the chickpea flour 1 tablespoon at a time and mix well and cook till you finish the whole gram flour. If the zunka looks like flour colour sprinkle some water and cook until combined. Note: I have used here 1/2 cup of gram flour. You can increase the volume up to 3/4 cup. An interesting take on the zunka! Can imagine the play of flavours and textures here . I would want to try this out real soon! Lovely veg dish. Its new to me but I am always on the go to try new dishes. nice one A new recip e or me! I usually make capsicum zunka, adding broccoli makes it healthier.. Looks tasty..
instead of other vegs, broccoli is healthy and yummy too, love it. 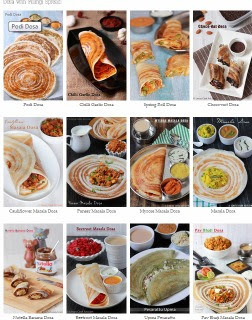 Liked your version of zunka...Looks so yummy. One of my fav side dish, its been a while i prepared it, prefect side dish for rotis.